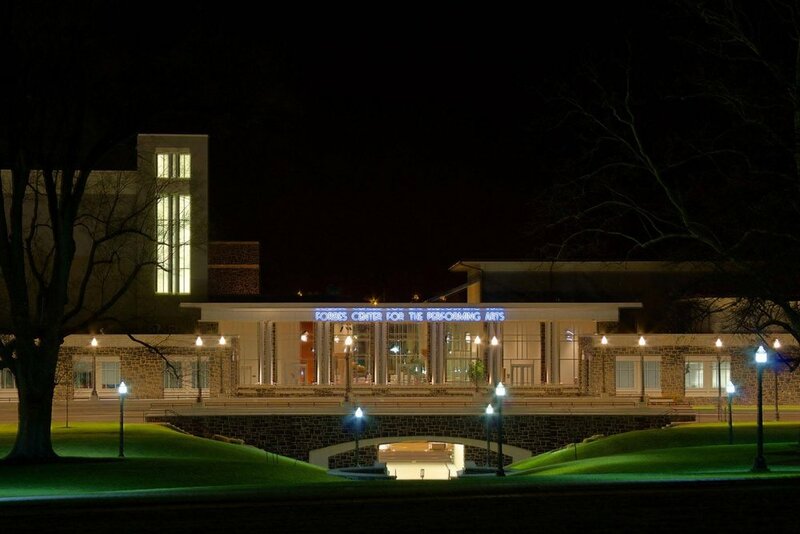 The Forbes Center for The Performing Arts acts as the western terminus of the historic main Quadrangle at the center of James Madison University. The landscape scope for this project included the redesign of one end of the quad, a new viaduct under Main Street, an arrival court for the complex, several smaller courtyards associated with the theater complex, a number of planted areas, and several secondary entrances to the building. The open spaces on the site have been configured to bring students and visitors down the axis of the Quad, under Main Street through the new viaduct, and into a series of courtyards. Landscape Architecture Bureau designed this connection along with a courtyard, arrival court, and pedestrian plaza at the public entry to the performance space. The design is unified through the serial use of rock outcroppings, exposed and shaped during construction, that echo the signature social space on campus at Wilson Hall. The main public entrance is shaped by a series of curved walls and steps that intersect the outcrops and provide much-needed informal social space for students and seating for theater-goers during intermission.